When you think about drinking salt water, what do you imagine? Do you see dehydrated sailors lapping up handfuls of ocean and going mad on long voyages? I know that’s my first thought… maybe it’s just me. In any event, salt water does not readily come to mind when one is asked to list healthy beverages. 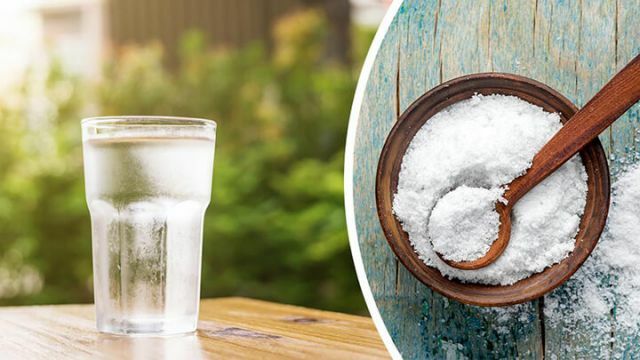 This is a shame because, when prepared correctly and consumed in safe, proper doses, salt water can provide your body with several important benefits. The type of healthy salt water preparation I’m talking about is Sole water. It’s simply a mixture of distilled water and unrefined sea salt. Completely natural, and easy to make at home. Many of the dangers that you hear about regarding salt (high blood pressure and more) are largely centered around refined salt. Excess consumption of refined table salt and high sodium processed foods are contributing to many of today’s metabolic illnesses, high blood pressure included. There is quite a bit of difference between using refined salt and using unrefined sea salt (or other unrefined salts such as Himalayan salt). So, what’s the problem with regular table salt? The main thing centers on the fact that it’s refined and stripped of its natural minerals. During processing, natural rocks of salt are heated to extremely high temperatures. This changes the chemical structure of the salt to pure sodium chloride. Then, additives including fluoride, silica aluminate (as in related to aluminum) and ferrocyanide are often added. These are additives that you do not want accumulating in your body. Then, the heated salt is bleached to give it a nice white color. Furthermore, because refined salt is stripped of its mineral content, it delivers sodium to your body without the minerals to balance it out. If your body gets too much sodium and not enough minerals such as potassium, blood pressure elevations can occur. Because of refined table salt, salt is now demonized and people think that an extremely low-salt diet is the answer. While salt consumption should indeed be kept in moderation, real salt such as unrefined sea salt is healthy for your body. Your body needs salt to survive, so cutting it out completely is not a good solution. Also, unrefined sea salt contains a wealth of minerals to balance out its sodium content. If you want a reason to switch from table salt to sea salt, and then to make a pitcher of Sole water, well, here are six. Sea salt, in its natural unrefined state, contains a wealth of minerals, including chromium, magnesium, selenium, zinc, bismuth and titanium. It also contains trace minerals of vitamin B2. If your diet is not rich enough in minerals, or if you’ve been depleted for any reason, drinking some Sole may help. Sole can help your body maintain optimal blood pressure and prevent inflammation. Did you know that the human body absolutely needs salt to function? If you don’t get at least a little bit into your day, your body may respond with more inflammatory agents, thus increasing your risk of chronic disease. You may also do damage to your circulatory system, among other dangers. Getting your daily dose of salt from unrefined sea salt and water can help your body to maintain optimal blood pressure levels, thus avoiding an inflammatory reaction. Real, unrefined salts help to stimulate digestion in the body. In the mouth, salt activates the salivary glands. Once in the stomach, salt — the real kind, that is — stimulates the production of hydrochloric acid. Both of these things are very important to the digestive process. So, if your digestion has been sluggish or just not quite right, give Sole a try (considering you have the go-ahead from a trusted health professional). Drinking plain water throughout the day (about eight glasses per day) is key to proper hydration and good health. However, adding a glass of Sole water to your day may help your body to better absorb the water you are taking in, so that you are more thoroughly and adequately hydrated. Salt water, used internally and externally, may have significant benefits for the health and appearance of your skin. It may help to reduce inflammation, dry up acne, banish excess oil, exfoliate dead skin cells and much more. Sole water may raise oxytocin levels and promote better sleep. Drinking Sole water an hour or so before bedtime may help to lower your stress levels and promote a more restful sleep. It may also raise your oxytocin levels naturally, making you feel more at ease. This a perfect recipe for optimal sleep. First of all, before you start any natural health regimen, it’s a good idea to talk to a health professional that you trust. Better safe than sorry! You’ll want to make sure anything you’re putting into your body is safe and beneficial for your individual health. Once you have the go-ahead from your doctor, you can make some Sole. Simply mix about a half teaspoon of unrefined sea salt (or unrefined Himalayan salt) into a glass of water, and drink either in the morning or before bed. Try it for a few weeks and see how you feel! Previous articleWhich Of These Five Love Languages Works Best For You? Hey Buddy!, I found this information for you: "Mix Distilled Water With THIS To Reduce Chronic Inflammation". Here is the website link: https://www.thealternativedaily.com/mix-distilled-water-with-this-to-reduce-chronic-inflammation/. Thank you.